president of Starneth LLC, an engineering firm working on both the Dubai and New York wheels. "the largest in the world not built by slave labor" just doesn't have the same kick to it. Damn it Dubai! I was on the 40 bus once on a Saturday many many years ago on my way home when some rich looking Taiwanese tourists ventured past the old St. George terminal to see Snug Harbor's immaculate 80 acres and two rooms of local art. The all panicked at the sight of the projects at Jersey Street and approached the bus driver clamoring to immediately take them back to the tourist safety zone around the ferry terminal. By the time the tourists tirade and panic was responded to by the bus driver, they had already reached Snug Harbor. I know I sound like a ranting old geezer but I want the Ferris Wheel. Maybe some men or women of vision and bankrolled by non-NY banks will turn Staten Island into the next Singapore and turn the old whore of Manhattan into the new Newark/Brooklyn of New York Bay. Staten Island has almost the same square mileage in space as Singapore. the rest is financing along with the venture capital for infrastructure and SI being on the Jersey side of the bay, the rest is location, location, Secession and New Jersey. The Trump bridge over the Narrows was built without space for subway surface tracks or even a pedestrian walkway. The purpose was to hide this gem away from the outside common people waiting for the global speculators to one day arrive. Last edited by Statun-Ilandur; November 8th, 2015 at 09:26 PM. Where will the outlet mall rise in Relation to the wheel? There were no rich Taiwanese on a Staten Island local bus.... Give me a break. I think SI is safe from the "global speculators" for the time being. STATEN ISLAND, N.Y. -- If all goes according to plan, commuters and others traveling to Manhattan on the Staten Island Ferry will once again be able to park vehicles in close, convenient proximity to the St. George terminal. 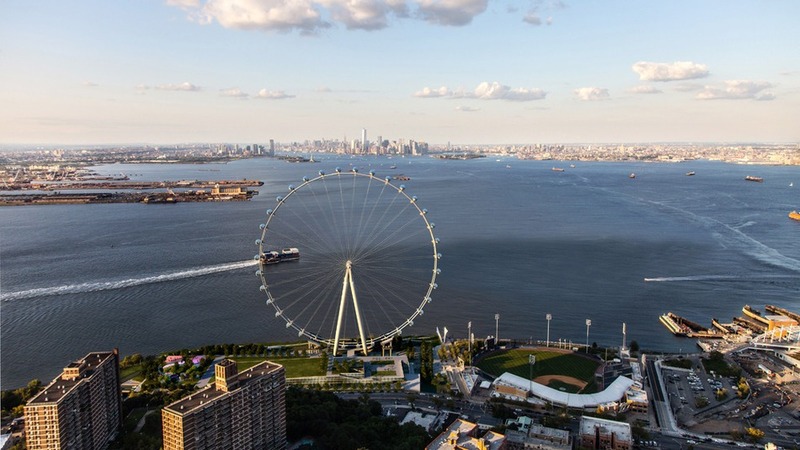 The New York Wheel pubic parking garage is expected to open on Friday, June 3, Wheel president and CEO Rich Marin told SILive.com. The waterfront garage will accommodate 820 vehicles in the first phase, with 950 total spaces available when construction is completed. Entrance to this public garage -- initially -- will be from Bank Street, at the foot of Jersey Street in New Brighton, Marin said. The crane regulations cost lost work days on the garage site. "I've lost count -- over 25 days" in total, Marin estimated. Marin provided additional information about eventual commuter access to the garage. "As you can see now, there is a new ramp from our garage second-level to Richmond Terrace at Nicholas Street," which intersects Richmond Terrace. "When we get all the proper permissions, we will do the curb cut and get the light adjusted, and open that ramp for parking traffic in and out of the garage," Marin reported. "It will be much more convenient for many commuters than going down to Jersey Street to get on Bank Street," he said. Direct access to the garage from Richmond Terrace is expected to be in place in summer 2016, Marin anticipates. "When we open on June 3, the garage will be attended (but likely no stackers). "We hope to amend the permit as soon as possible to allow over 40 percent of the spaces to be self-park," he said. "Then we expect -- before the end of the year -- to have the rest of the garage constructed and certified for use so that there will be a 950 car-capacity, of which 660 spaces will be self-park." Big Mac, please. There are children who may be using this site.